of mind that our work will, stand the test of time…. An entire new roof using water reed, fixed over existing thatch to give a more soft and rounded appearance. The work took five weeks and the owners were delighted with the result! The majority of water reed used today is imported mainly from Turkey, Hungary, France and Ukraine. Water reed from Norfolk can still be sourced but is mainly used on English heritage work due to its short supply. As with combed wheat reed, the crop changes from year to year so reed from one country will not necessarily be used every year. Water reed is generally a lot longer in length than combed wheat and also a lot harder. It has a thinner, more angular appearance than combed wheat reed and is usually applied directly to the roof timbers to a minimum thickness of 350mm, then secured with stainless steel screw wire fixings. Water reed can also be applied over an existing roof to give the softer more rounded appearance of combed wheat reed (Planning permission would be needed). When new, only the ridge is covered in wire netting. If a good quality reed is used and the roof is maintained properly it should last between 40 and 50 years. 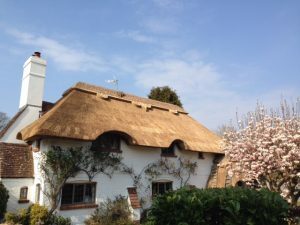 Combed wheat reed has a history dating back more than 700 years and is used only in the UK as a material for thatching both main elevations and ridges. 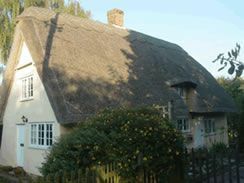 It is normally placed on top of the existing roof and fixed on using hazel spars, but can also be applied directly to timbers as a single layer thatch, like water reed. The entire roof is usually wired in to protect it from the elements and vermin. The appearance of a wheat reed roof is often thicker with a softer, more rounded appearance compared with the more angular appearance of water reed. Each harvest is different and it can often be challenging to source good quality materials, but a major advantage is that it is grown mainly in the South of England. If a good quality material is sourced, a combed wheat reed roof should last between 20 to 30 years. Long straw thatch is again fixed on top of the existing coat of thatch like combed wheat reed, but does not have butts one end and ears the other as combed wheat does. It has long lengths of straw on the surface with the ears of the straw visible, giving a more ‘poured on’ look. 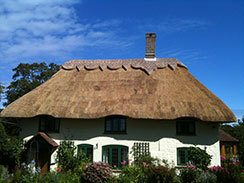 Long straw roofs will also have a hazel pattern around the eaves, similar to the ridge. As with combed wheat reed, the entire roof is covered with wire netting to protect it from the elements and vermin. Good quality long straw should last between 15 to 25 years.